Family reunification is one of the central tenents of the child welfare system, yet research supporting effective practices to promote safe reunifications is limited. As a departure from previous initiatives, the Parent Partner (PP) program enlists as staff mothers and fathers who have experienced child removal, services, and reunification. This study examines outcomes for children served by the PP program. The experimental group includes 236 children whose parents were served by a Parent Partner and a matched comparison group of 55 children whose parents were served by the public child welfare agency in 2004, before the Parent Partner program was established. Cases were examined 12 months following case opening to determine reunification status. Results from the outcome study indicate that reunification may be more likely for children whose parents were served by Parent Partners. Although there are limitations to the data, findings from this study suggest that the Parent Partner model may hold promise as a child welfare intervention designed to support reunification. Former child welfare parent clients can provide important family support services to birth parents new to the child welfare agency. 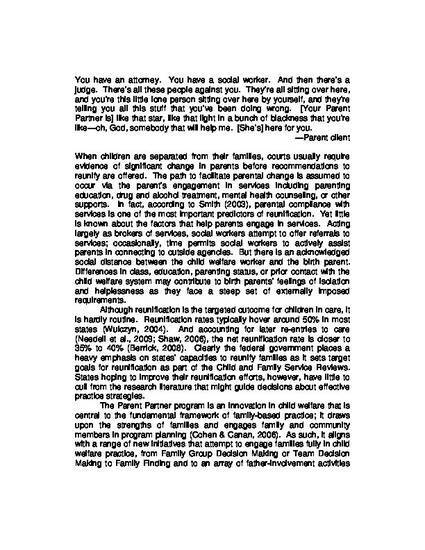 Reunification may be enhanced using former child welfare parent clients as service providers. Findings from a study of “Parent Partners” suggest the promise of using a strengths-based family support model with child welfare clients. Jill Duerr Berrick, MSW, PhD, serves as the Zellerbach Family Foundation Chair and Professor in the School of Social Welfare and co-director of the Center for Child and Youth Policy at the University of California, Berkeley. Berrick’s research focuses on the child welfare system and efforts to improve the experiences of children and families touched by foster care. She has written or co-written ten books on topics relating to family poverty, child maltreatment, and child welfare. Her most recent book, Take Me Home, offers policy and programmatic reforms for an improved child welfare system. Edward Cohen is Associate Professor and Graduate Program Coordinator for the School of Social Work at San Jose State University, San Jose, California. Dr. Cohen earned his MSW and PhD in Social Welfare at the University of California at Berkeley. He is former Director of the Center for Social Services Research at U.C. Berkeley's School of Social Welfare. His main research interests are in mental health and community support services for children, adolescents and young adults. Dr. Cohen teaches courses on research methods and analysis. Elizabeth K. Anthony, PhD is an Assistant Professor in the School of Social Work at Arizona State University where she teaches advanced practice with children and adolescents and practice-oriented research. Her research and publications focus on resilience among children and youth living in urban poverty and the prevention of risk behaviors and mental health conditions among culturally diverse adolescents. Dr. Anthony’s current study in multiple public housing neighborhoods supports the design of a preventive intervention to increase coping skills and healthy development among adolescents exposed to considerable risk and stress. Special thanks to Patrick Harrington, Elizabeth Wilder Young, David Androff, Krista Drescher-Burke, Anna Geer, Japera Moses, and Sarah Taylor for their contributions to this study, and to the staff and families associated with the Children and Family Services Division in Contra Costa County. This project was supported by a grant from the Contra Costa County Employment and Human Services Department and the Department of Health and Human Services, Administration for Children and Families, Children’s Bureau. J D Berrick, Edward Cohen and Elizabeth Anthony. "Partnering with Parents: Promising Approaches to Improve Reunification Outcomes for Children in Foster Care"